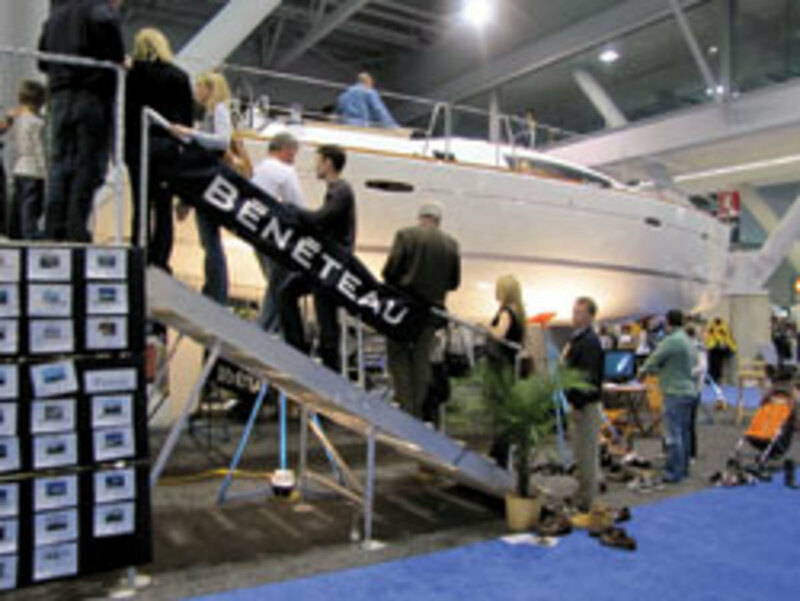 Crowds at the New England Boat Show in Boston seemed genuinely upbeat and positive, and there were more than a few buyers among the throngs. "It&apos;s definitely better this year, and people are definitely more positive," says Bob Quintal, service director at Bosun&apos;s Marine, which has two locations in Massachusetts. "Two years ago it was like going to a funeral; now people are head and shoulders above where they were then. The Consumer Confidence Index is up and that&apos;s translating here." 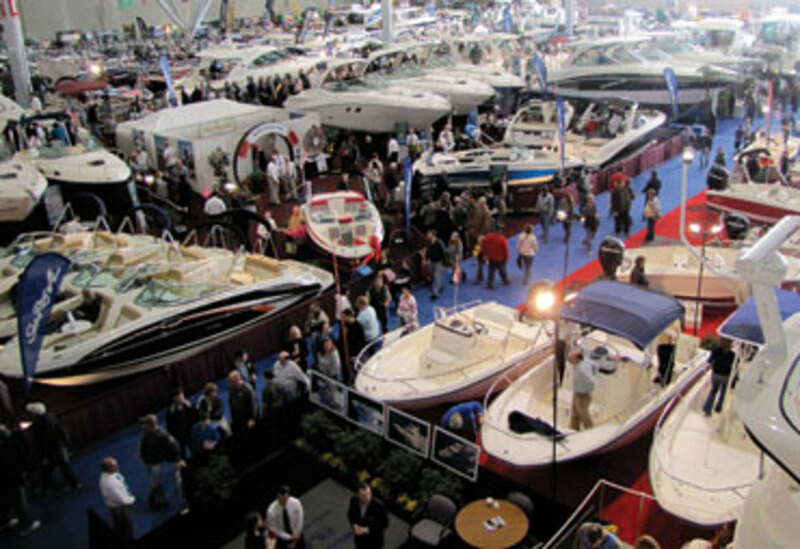 Peter Orlando, a sales and marketing manager at EdgeWater Power Boats, says New England was the biggest of the 10 boat shows he has attended this year. Others he has visited include New York, Philadelphia and Atlantic City, N.J. "This market&apos;s a little better than some markets," Orlando says. "That translates to dealers, too." Orlando, like many, thinks the Boston Convention and Exhibition Center is a perfect setting for the show. Natural light pours in from each side and the 90-foot ceilings accommodated the show&apos;s first Sailfest, with exhibitors displaying sailboats from 8 to 45 feet. Lines formed as visitors waited to board the Hunter 45 Deck Salon. John Huether, of Cataumet Boats, which has locations on Cape Cod and Rhode Island, says he was gathering strong leads. "People are getting out of that doom and gloom," Huether says. "People are still cautious; they are spending their money wisely, but they are spending money." A longtime Grady-White dealer, Cataumet recently added Sailfish to its offerings. The center console Sailfish 218, 2360 and 2660 did well at the show and so did Grady-White&apos;s Freedom bowrider, Huether says. The show ended March 6 and had a nearly 6 percent increase in attendance, to 43,068, over last year. The nine-day run often coincides with school vacation week in Massachusetts; this year it did not, and that pleased some exhibitors. Huether believes buying a boat can be difficult with children present because the parents&apos; attention is divided between watching the kids and questioning the salespeople. Andrew Sheriff, of East Coast Yacht Sales in Portsmouth, R.I., says prospective buyers of the $650,000 MJM yacht he was sitting on might have chosen to vacation in some warm climate during the school holiday period. Sheriff cringed when he saw an advertisement boasting that Patrick the starfish, a character from "SpongeBob SquarePants," would be one of the show&apos;s attractions. He also wished that children did not receive free admission. "Parents are focused on the kids and hopefully keeping them from jumping on the furniture," he says, glancing down at supple white leather seats. One exhibitor says he caught a child trying to use the head and another says a few kids he found climbing on some furniture had been dropped off at the show. Still, Huether says he appreciates the family-friendly atmosphere. "Boating is a family affair," he says. "That&apos;s what is selling boats right now - spending quality time with the family." Orlando agrees. Even though he estimates that 80 percent of families with young children weren&apos;t buyers, the show gives them some exposure to boating. 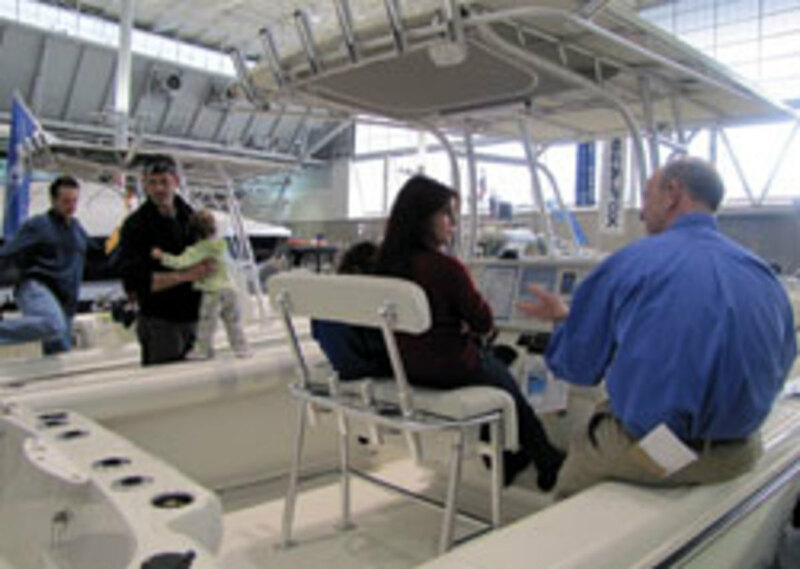 The New England show offers more saltwater fishing boats and custom boats than many other shows do, he points out. Charles Tasso, marketing director for semicustom builder NorthCoast Boats of Bristol, R.I., says show sales are rare, but the leads he gets are valuable, particularly now that he markets directly to customers. It&apos;s the same for Ken Hilton, who sells Albin boats at Standish Boat Yard in Tiverton, R.I.
"Albin is around a $200,000 boat, so the type of people who buy them need to get the initial contact with it, follow up, go out for a demo down at the boatyard and then, hopefully, you sign them up," Hilton says. "Two years ago, people weren&apos;t even asking questions." This year he&apos;ll have plenty of leads to follow up after the show. Only half of the convention center&apos;s 516,000 square feet of exhibit space was used this year, but organizers say they will increase that to two-thirds next year. Squeezed out this year was the National Marine Manufacturers Association&apos;s Affordability Pavilion - a concept developed to spotlight lower-priced boats. Instead, the NMMA put giant red bows on all boats that could be purchased for payments of less than $250 a month and distributed fliers detailing each of them. The ribbon-clad boats generated a lot of interest, show manager Joe O&apos;Neal says. "There are a few hot spots, like Whaler," O&apos;Neal says. Dawson Farber III, of Cape Cod dealership Nauset Marine, says he and Boston-area dealer Russo Marine sold 36 Whalers from 13 to 34 feet at the show. Russo Marine owner Larry Russo says he also sold 39-, 44-, 45- and 47-foot Sea Rays. Pontoons and deckboats also did well, says Cathy Rick-Joule, vice president of the NMMA&apos;s boat shows division and organizer of the Miami International Boat Show. And three Ranger Tugs at the show sold (a 21, 27 and a 29), according to Winter Island Yacht Yard in Salem, Mass. Some wondered whether fuel price concerns stemming from the unrest in North Africa and the Middle East was deterring potential buyers of large boats. "I just hope the fuel issue doesn&apos;t put the brakes on the momentum we&apos;ve been having," Tasso says. Fuel economy attracted potential customers to MJM Yachts, says broker Linda Warren of East Coast Yacht Sales, which has four locations in Massachusetts and Rhode Island. MJMs are built using resin infusion, a process that produces lighter, stiffer boats that are more efficient than other yachts of the same size. "And they&apos;re a blast to drive." O&apos;Neal was less concerned about gasoline prices. "I don&apos;t think the fuel issue will put the brakes on the industry unless it turns the overall economy around," he says. "With a boat, it&apos;s not like a car that you have to drive to work; you can control how much you spend on gas." This is the second year that the show has been under ownership of the NMMA, which retained longtime manager O&apos;Neal. Most exhibitors say the transition from the North American Expositions Co. has been seamless. Several were pleased that the show wasn&apos;t shortened, an initial concern. On the other hand, Joe Rogers, sales manager at Captain Bub&apos;s Marine, would rather have seen the nine-day run trimmed to three or four. 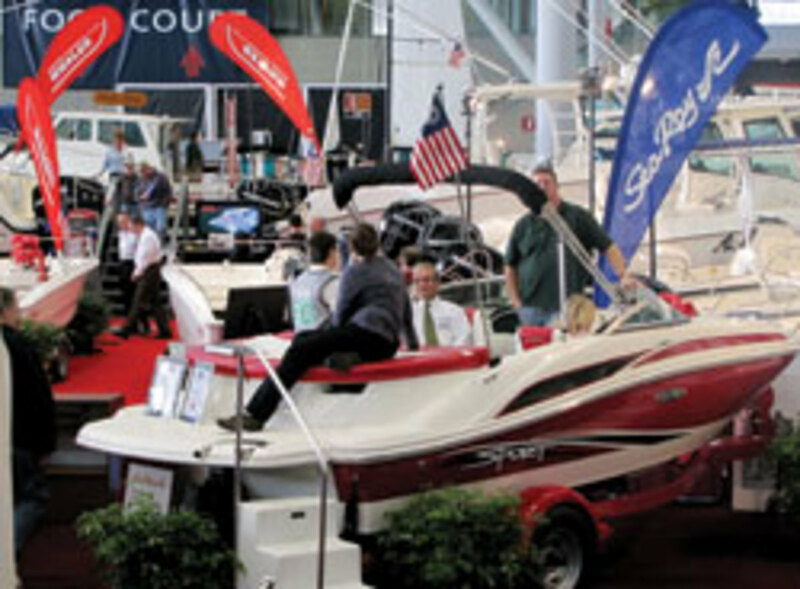 The Lakeville, Mass., dealership caters to a freshwater clientele and Rogers had hoped that the show would have a larger aluminum bass boat presence. His Trackers were the only aluminum boats on exhibit, he says. A few exhibitors say they wished the show had been better advertised. "It&apos;s a beautiful venue, but it needs to be promoted better," Rogers says. "They probably need to spend more," Orlando agrees. "They did a great job marketing, but this venue is a little difficult. It&apos;s not a consumer-driven venue." Rick-Joule says the NMMA uses Facebook and Twitter as promotional tools in an effort to reach young buyers. The organization also advertises in magazines, does television and radio spots, and posts on billboards, O&apos;Neal says. The NMMA rarely advertises in newspapers anymore because it&apos;s expensive and tends to reach an older audience, O&apos;Neal says. "It&apos;s a big debate internally - what papers do we advertise in?" says NMMA executive vice president Ben Wold, who also was visiting the New England show for the first time. "Every market is different ... and we look at all of it," he says. The Boston Globe&apos;s planned paid online edition wasn&apos;t available in time for show organizers to use as a marketing tool, but it could be an option next year because it theoretically would reach younger people, O&apos;Neal says. All in all, most exhibitors seemed pleased with the show. "People should be thrilled coming out of here," Orlando says. "There are a lot of people here with winter blues. They have a lot of pent-up energy and want to find a way to look forward to spring. After a heavy winter, people are very excited about boating."